Been invited to a lot of weddings lately? No surprise: We’re striding steadily toward peak wedding season, and love — or at least “I do” — is everywhere. But in between dancing the Cha-Cha Slide and taking advantage of the open bar, you might find all those white party favors are turning your thoughts a little green. No, I don’t mean with envy — although maybe that, too. I’m talking money, honey, and how much of it we spend on getting hitched. Weddings are Expensive — But How Expensive? It’s pretty well-established that weddings are expensive. But it turns out some of our go-to figures for the “average” cost are bogus. In fact, the amount most of us spend on our day of matrimonial bliss is probably orders of magnitude below the figure published by publications like The Knot every year. That’s what Slate writer Will Oremus discovered when he crunched the numbers. Although his piece is a few years old, its findings hold true — and they’re super important for newlyweds-to-be. Here’s why the “average” wedding cost is all wrong. First of all, that “average” cost you’re citing? To get it, someone (well, a lot of someones) had to self-report their expenses. And the couples excited enough about their weddings to take part in that kind of survey are probably more willing — and able — to spend a decent chunk of change on their special day. 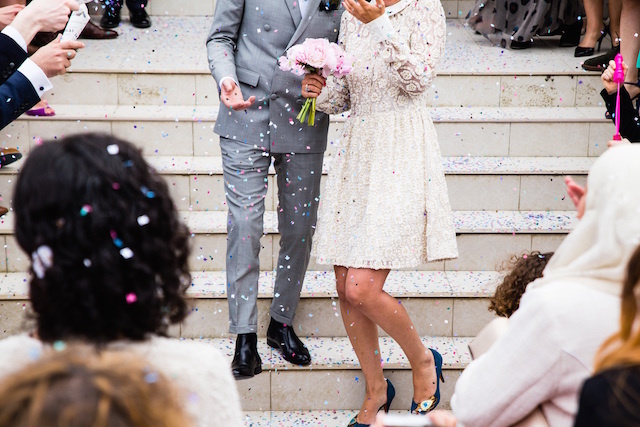 Almost all the “average wedding cost” data on the Internet — even the stuff published by names like Reuters and CNN Money — comes from the “Real Weddings Survey” conducted by The Knot and The Wedding Channel, writes Oremus. “The big wedding studies have excluded the poorest and the most low-key couples from their samples,” writes Oremus. The other problem with our go-to wedding cost benchmark? The average of a given set is more easily skewed by an outlier than other statistics, like the median. The mean, or average, is what you get when you add together all the examples you’re talking about — in this case, all the self-reported wedding costs — and divide them by the number of examples. ($10,000 x 99) + $1 million = $1,990,000. Divide that by the 100 couples who responded, and you get $19,900 — not exactly a representative figure, right? I’m not saying $18,000 is a cheap soiree, but it’s a long shot from $30,000, right? And bear in mind, these numbers still come from the affluent and enthusiastic people who do things like respond to wedding cost surveys. Well, you should care, because the industry uses those numbers to price their services. “Complain about a reception venue’s $250 ‘cake-cutting fee,’ or its $10,000 food and drink minimum, and you’ll be curtly informed that it’s standard in the industry,” writes Oremus. And if you believe the “average” wedding should cost $32,641, as most recently reported by The Knot, the $13,000 you spend on your soiree will feel downright frugal — even though it’s still a giant sum. Now that we’ve dispensed with the illusion your wedding should cost more than your first salary, here are some ways to get seriously frugal on your big day. Here are 101 creative ways to save money on your wedding, which cover everything from the ring to decor. Another creative idea? Put off your reception. And while you’re waiting for the party, put these 20 gifts on your registry to save a ton of dough down the line. After all, it’s not about the party, it’s about the person you love. And although it’s hard to come by, true love does have the perk of being 100% free. Your Turn: What did YOU spend on your wedding? Jamie Cattanach is a staff writer at The Penny Hoarder. If she ever gets married (doubtful), she’ll probably elope.